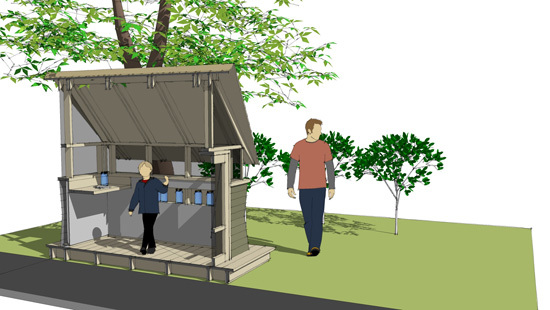 The entries for this years Dallas CASA Parade of Playhouse design competition hosted by the AIA Young Architectects Forum are all due tomorrow – which means I need to show everyone what I am planning on doing before those submissions come in. Since I put that competition together, I think it would be a good idea for me to present my design just to make surenobody thinks I am working off their idea. And Since I am also a judge … well, you get the idea. This will be the third consecutive year that I have been a part of this playhouse event and this is the fourth playhouse I have designed. 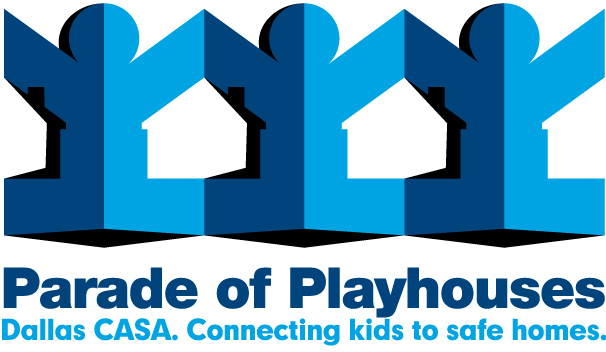 This is a wonderful event and I have talked about it at length many times here at Life of an Architect – if you’re new, you can catch up on this year’s event here and for a back story on what CASA actually does for children, you can go here. So here it is – in all it’s unfinished glory!! I present – the Bug House. Right up front I am going to confess that the model isn’t finished – I am missing a few very key details … like a front door! I ran out of time getting this post prepared had to create the animation at this point in the development because I had to get this post out today. 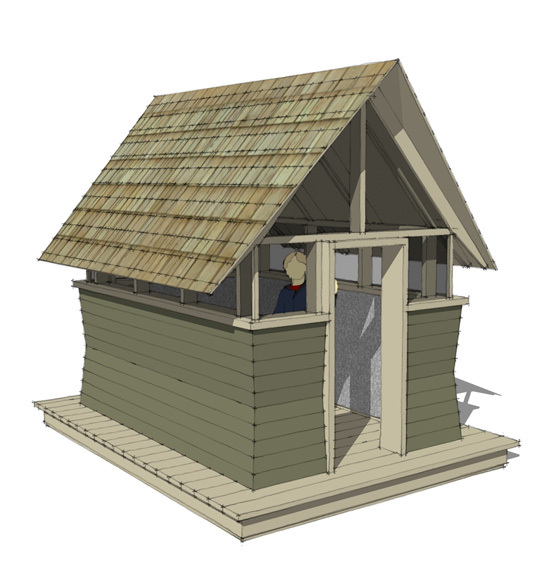 I still have the same rules in place as last year for the playhouses I design so yes – this design is similar to what I did last year but it is actually very different. 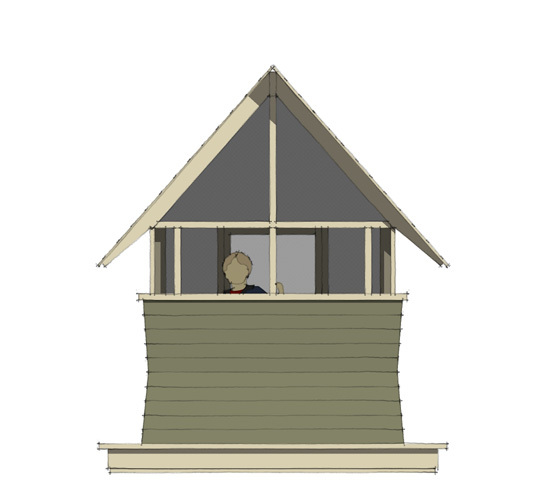 The upper portion of the playhouse will be covered in wire screen or hardware cloth – not sure which just yet. I also made the structure much more narrow that I was allowed because I really wanted to accentuate the verticality of the building. That’s right – I’m talking about proportions. 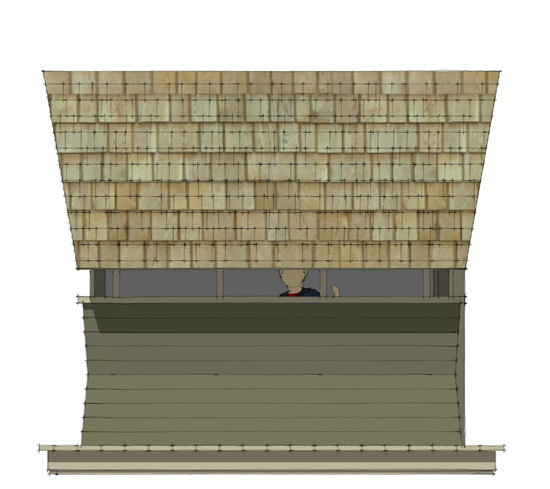 The overall height of this little building is under 7′-6″ but you wouldn’t know that just by looking at these images. I still made sure that I designed where every single stud went – I like to make the structure of the building a feature instead of covering it all up. 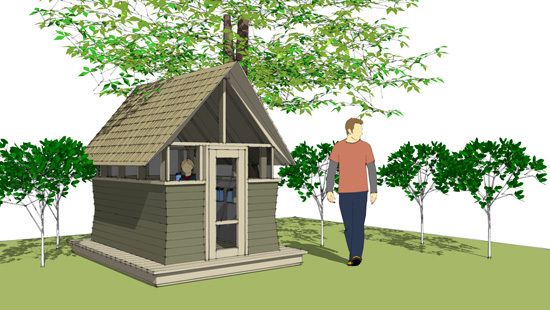 Since this playhouse will be located in Dallas, Texas – where it tends to get hot – I want air circulation. I know I wouldn’t want my kid playing in there without some air movement. Otherwise, it makes me think of the hot box in the movie ‘Cool Hand Luke’ … “Son, what we have here is a failure to communicate”. The building has some implied movement with the form and I think is evocative of some sort of organic life – but you would need a microscope to be sure. And speaking of microscope, I received all sorts of input on this years design from resident cultural prodigy Kate Borson and I am listening. While I thought last years design was really good, it didn’t resonate with the kiddo’s so I decided to go to the one person who I know has her finger on the pulse of today’s youth. After discussing my initial concept, Kate steered my away from a ‘butterfly’ theme and towards a ‘bug’ theme. She also reviewed my progress the other night and made some recomendations on the interior spaces – some of which would have shown up on thier own (honest). Eventually the interior will be respendant with glass jars recessed into slots between the studs, half filled with dirt. There will be ant farms, butterfly nets, some books on bugs, places to pin up maps where good bug hunting can be found, etc. It’s going to be AWESOME!! 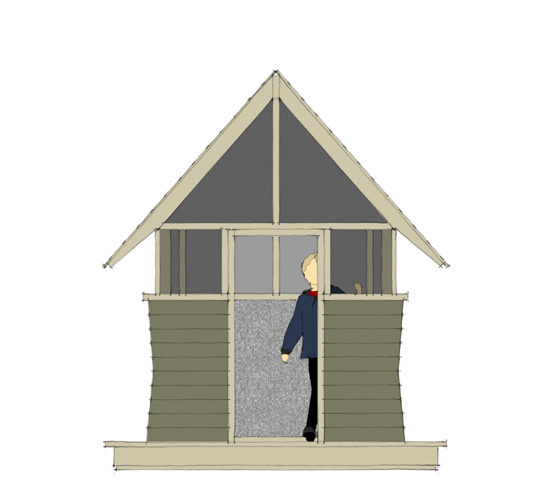 Here is a video animation of the bug house. I hope you enjoy watching it as much as Kate and I had picking out the right sort of music. I gave Kate some options and she choose ‘Clair de Lune’ by Claude DeBussy.